What’s sweet, spicy and as fun to eat as it is to make? These Crunchy Fish Stick Cones from A Zesty Bite, of course. Make a cone shape with each tortilla and secure with a toothpick. Place crumpled up foil in the center of the cone to help keep its shape. Place tortillas on a baking sheet and put in the oven for 6 minutes. Flip the tortillas and bake for an additional 4 minutes. Remove from oven and take out the foil. Line a baking sheet with fish sticks and place in the oven for 8 minutes. 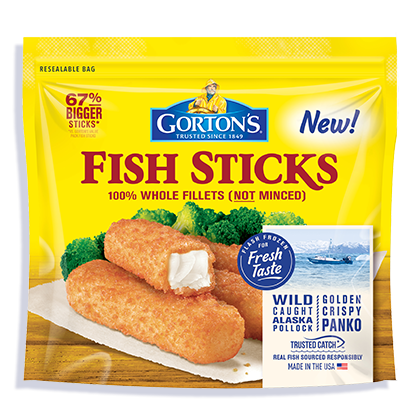 Flip the fish sticks and cook for an additional 3-4 minutes. Remove from oven. In a small bowl combine coleslaw and mango. Grab a cone and fill it with fish sticks and coleslaw. 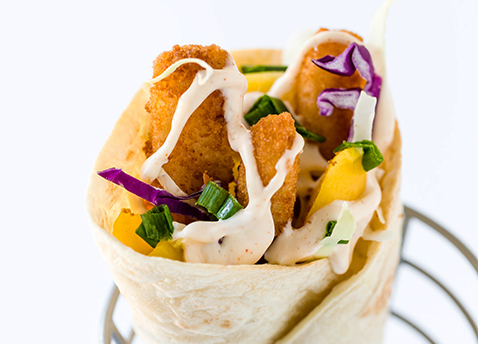 Drizzle the spicy mayonnaise on the top and garnish with green onions. For the Spicy Mayonnaise: In a small bowl combine all of the ingredients for the sauce. Place in refrigerator until ready to serve.